Pigmentation is the coloring of a person’s skin.The pigment melanin produced by Melanocytes, is the substance in the body that is responsible for color of the skin. The most important substance determining dark skin colour is Melanin. The light skin colour is determined mainly by the bluish-white connective tissue under the dermis and by the hemoglobin circulating in the veins of the dermis. 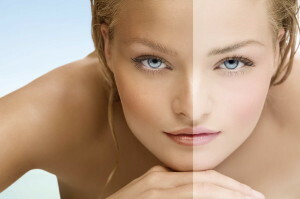 In a healthy person skin will appear normal in color. If there is any change which causes the normal cycle and total turnover of the cells the skin , it will show as the colour change on the surface of the skin. The skin can become either darker (Hyperpigmentation) or lighter (Hypopigmentation), according to the pathology present.Pigmentation on face reduces the glow in the face. Hyperpigmentation is very common skin change where skin gets darker in spots, patches or can be seen covering the total skin itself. It results from excessive cutaneous melanin deposition, either in the superficial layer of skin, the epidermis or the deeper dermis. The change can be seen sometimes as localized spots or as wide spreading patches. Age – As the body ages, the natural cycle of skin shedding becomes low, and the dead cells tend to accumulate over the skin surface. As the Melanocytes are present in the upper layer of the skin, the epidermis, the skin becomes more darker if the damaged cells are not removed. Eventhough the Melanocytes decrease in number with age, the remaining cells enlarge in size and the cells accumulate unevenly on skin. This leads to patches and brown spots, referred as freckles and age spots. As The blood vessels of the dermis become more fragile, they are easily bruised and leads to bleeding under the skin, leading to discolorations. Sun Exposure- The melanin pigment is the one which protects the skin DNA from mutation by sun damage. The skin responds to UV Rays exposure by thickening of the stratum corneum cells and increasing the melanin pigments in cells of the epidermis. UVA can pass through the windows also and will penetrate to deeper layer also. UVB is usually gets blocked by window and is mainly affecting the upper layers of skin. Both the rays will stimulate the melanin to divide and accumulate more, leading the skin to become more tanned and pigmented. Hormonal Imbalances- The most common Hyperpigmentation due to hormone imbalance is melasma. While there is a definite genetic component to the disease, it is generally triggered by hormonal changes. Melasma occurs when the Melanocytes are stimulated by abnormal levels of progesterone and estrogen, due to pregnancy, menopause or use of Oral Birth Control Pills. If Melasma affects epidermis, the discoloration will be darker and if it affects dermis, the change will be lighter. when both the layers are affected, it leads to give an appearance of mixture of darker and lighter pigmentations. Postinflammatory Hyperpigmentation – This usually develops after resolution of inflammatory skin eruptions like acne, contact dermatitis, or atopic dermatitis. This is the result of overproduction of melanin after cutaneous inflammation. Addison’s disease and other sources of adrenal insufficiency, which elevate hormones that stimulate melanin synthesis, such as melanocyte-stimulating hormone (MSH). Cushing’s disease or other excessive adrenocorticotropic hormone (ACTH) production, because MSH production is a byproduct of ACTH synthesis from proopiomelanocortin (POMC). Acanthosis nigricans – hyperpigmentation, found in body folds, like the posterior and lateral folds of the neck , the axila, groin, umbilicus , forehead and other areas. This is mostly associated with insulin resistance. Peutz-Jeghers syndrome –This is an autosomal dominant disorder characterized by hyperpigmented macules on the lips ,oral mucosa and gastrointestinal polyps. Certain chemicals such as salicylic acid, bleomycin, and cisplatin. Haemochromatosis – This a debilitating genetic disorder characterized by the chronic accumulation of iron in the body. The colour and size of the dark spots and patches on the skin, show changes according to the layers where the damages are actually happening. As the available treatments in the market are able to reach mostly the upper layer only, without going to the internal layer damage, they are having limitations in their actions and regenerating power. The Siri Care clears both the upper and lower layers of damage and rejuvenates the skin from deep. With the first step solutions, this helps in removing or fading the discoloration in the skin. The rejuvenating second step will encourage collagen production helping new cells to grow and tightening the skin. This will result in a more even, healthier, glowing, fresher, younger looking skin tone. Almost all the types of skin damage due to Hyperpigmentation can be treated with Siri Care. So any part of the body, which is tanned and pigmented, like hands, back, neck and on the whole body itself, to get a renewed and refreshed skin.Pigmentation creams can reduces the dark spots and tanned skin. The growth factors and stem cells present in the solutions will encourage the skin layers to produce more and more new fresh cells giving the skin new glow and softness. As new capillaries are also formed, the cells will be healthier , as they get more nutrition.Best Treatments for pigmentation is available now. The use of regenerating moisturizer and strong sun protection are also advised to go on with the glow and freshness. The underlying cause of hormone imbalance is also should be treated to prevent further recurrence of the patches and spots on the skin.